What's up, Catsup? Welcome to the first and only Catsup Museum in the World... thanks to Nutri Asia! Welcome one and all, to the world's first and only Banana Catsup Museum! Congratulations to NutriAsia, Inc.! This blog post is one of the longest if not the longest I've ever published here because of three things: I absolutely loved and enjoyed every moment of this hosting gig, this is a special event because I got to bring my son along and lastly, there are just too many cool photos taken and totally awesome trivia learned at the Banana Catsup Museum tour that I just have to share here! Stuff that blow your mind and make you proud to be a banana catsup loving Filipino at the same time! Going Bananas. Who wouldn't love posing right here at the museum foyer? It's raining bananas... because here (and in our kitchen), bananas reign supreme! Reach for the stars! Yup, bananas (and banana catsup of course) are the shining stars in this museum! The quirky banana catsup factory... you will be so enthralled! I wonder where my son is hiding... we're supposed to head to the Orosa Hall now. Hmmm, where could that cheeky boy be? And here we were, as you can already see, at the Maria Orosa Hall. Maria Orosa wasn't just an amazing cook and food tech; she is heroine who concocted superb catsup made from bananas during World War 2, and she also helped save and nurture tons of lives during those very difficult times! People like her make me truly proud to be Filipino! Banana Catsup puts the "YUM" in Museum! My Matthew going crazy over the replicas of yummy grub which you can pour your banana catsup on... he loves burgers in real life, and here in this museum too... Can you say MuseYUM! Hope to see you all at this awe-inspiring MuseYUM! My little superhero defending the banana catsup making machine from the evil fiends of the Bananions... the Rotten Tomatooks who want to take away all the bananas so we can no longer make any more banana catsup for they do not want to share catsup supremacy with the hard-working, cheerful Bananions! Oh, why can't we all just be friends? I absolutely love UFC, but as for my son, he just loves his Papa... Ketchup! Both UFC, Papa and even Jufran banana catsup are all proudly made by Nutri Asia. And for sure you've all heard the news that they've also acquired Del Monte in the United States about more than two years ago. It really is great to be Filipino! And yup, like any kid, my son loves fried chicken and pouring banana catsup on his chicken (and also over every fried meal he eats). Patiently waiting for his turn to pose like me as I pour catsup on the replicas of another one of hi faves: burger and fries! But nope, I won't let him have his turn. This photo essentially captures how we fight over the bottle of banana catsup at home. We love each other so much and I am usually generous with my son... but not when it comes to our favourite catsup! This is the Mom versus Kid Battle... or Bottle! 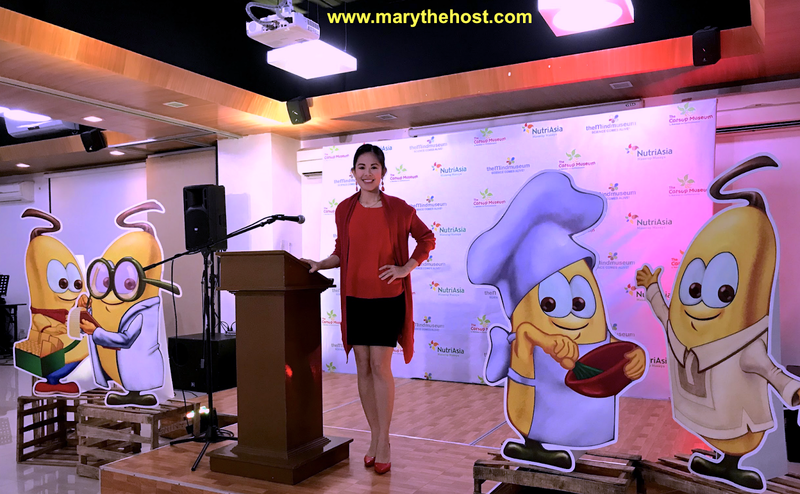 And now, here I was with some of NutriAsia's wonderful big bosses, Ms. Ampy and one of the owners... Special shout out to Sir James Lim of Marketing for letting my little boy join in on the fun; unfortunately we don't have a photo together for this event but I made sure we have a snap together for my second gig for NutriAsia (so please stay tuned). But here's my very own big boss, my little VIP who probably enjoyed the tour so much more than I did! And I tell you I enjoyed it a bunch... get it? A (banana) bunch! To end, let me quote the very words of my life's greatest love, in his catsup-crazy-drunk words in the photo below... thank You Lord, for my son... thank You Lord for banana catsup!!! Stay tuned for my next adventure with the Bananions! BananaBYE for now!